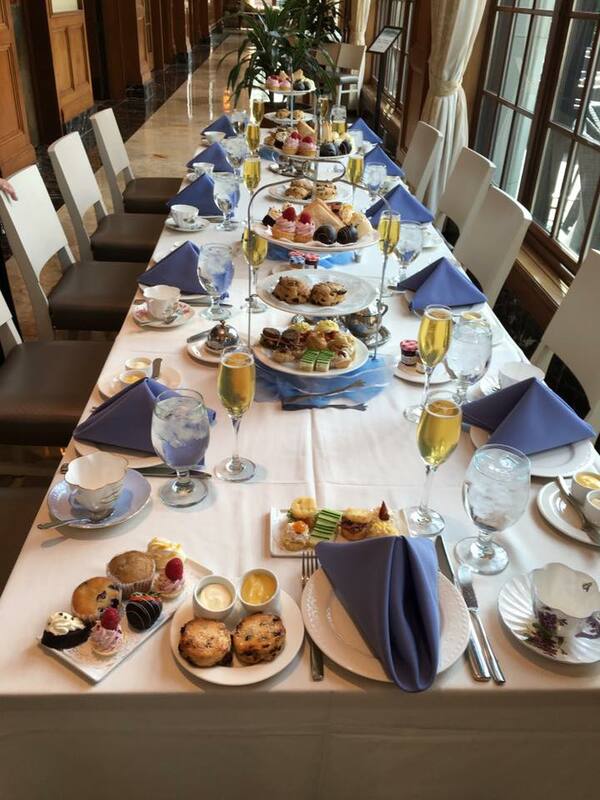 Afternoon Tea is served daily in the Parlor of the Grand beginning at 3:30 pm. Seated on large comfy chairs or soft sofas, we gathered around low tables set with the Grand Hotel china. We were offered hearty English Breakfast tea, poured from silver teapots. This plate features the assorted tea sandwiches that were served, including sliced cucumber served open faced, sliced ham, egg salad, and chicken salad. The vegetarian option had a beautiful and colorful assortment of open faced sandwiches. Strawberries with a raspberry sauce, fresh asparagus tops, a mango fruit combination, and open faced cucumber were some of the sandwiches. They were very fresh and quite tasty. The gluten free sandwich plate had a variety of artistically placed garnishes atop each sandwich. The Grand easily accommodated dietary requests made in advance. Once the sandwiches were devoured (err, daintily nibbled), a plate with a "scone" and a jar of jelly along with a beautiful variety of desserts was served to each guest. Chocolate covered strawberry, an almond white chocolate truffle, a pastry shell frilled with cream and glazed fruit, and a citrus petit four were all enjoyed. In addition, a petite parfait with homemade fudge sauce in the bottom and whipped raspberry fluff was also served with the desserts. We all enjoyed this casual yet elegant Afternoon Tea in the Parlor while beautiful music played in the background. There were guests up and down the length of the hotel taking tea. The ultimate destination for the Michigan Tea Tour was a journey to Mackinac Island with an overnight at the Grand Hotel. We traveled to the very tippy-top of Michigan to catch the ferry to take us to the Island. As a bonus, the ferry sailed under the Mighty Mac bridge. This 5-mile suspension bridge (the largest in the Western Hemisphere) divides Lake Huron from Lake Michigan and connects Michigan's Upper and Lower Peninsulas. No vehicular traffic is allowed on the island, so all transportation is by horse and buggy, bicycles, horse drawn taxis, or walking. With approx. 600 horses on the island, there is a continuous clippity clop of hooves throughout the community and pooper scoopers are kept busy. Thousands of tourists arrive on the island from May thru October while approx. 450 permanent residents reside here year round. They rely on snowmobiles during the winter months. The Grand Hotel, constructed using Michigan white pine, opened in 1887 and is considered the world's largest summer hotel. Famous for its stately colonial porch, the showy display of American flags, and window boxes full of red geraniums, it exudes elegance from a former era. Luxurious and elegant inside and out, Afternoon Tea is served daily in the lobby. A journey to Saginaw, MI took us to the Japanese Cultural Center where the long term friendship between Tokushima city in Japan and the citizens of Saginaw in Michigan is recognized. These sister-cities established a relationship in 1961, and over the years a Friendship Garden and a Tea House have been built on the grounds here, considered both American and Japanese soil. There is a quiet serenity and tranquil beauty to be found here as you stroll the three acre garden. Cherry trees, peaceful pathways, stone lanterns, beautiful vistas, and one of the most authentic tea houses in North America. Working with the mission to promote intercultural understanding and peace through a bowl of tea, we were able to observe a Japanese Tea Ceremony. This ceremony was not the customary ceremony performed on your knees, but rather an adapted ceremony where the hostess was seated at a table. This style has been used for the comfort of American attendees, and for the ease of the aging hostess. The traditional kimono was wore by the presenters. And the matcha tea was prepared with precision and attention to detail using specific utensils for each step and guided by four principles. In our brief introduction to the Way of Tea (Chado), we learned that these four basic principles include harmony, respect, purity, and tranquility. Once the tea ceremony demonstration was completed, we were each served two sweets, yokan, a jellied sweet made with red kidney bean paste and the round one, kuri shigure made with chestnut powder. After eating the sweets, we were served a bowl of whisked matcha, and invited to ask any questions. Meet the cast of characters, the Michigan Tea Tour participants, and the bloggers, and the tea ladies. Representing four states; Michigan, Ohio, Kentucky, and Pennsylvania, and Canada, we converged in Michigan for a memorable adventure. Four of us, Lori, Phyllis, Linda and myself originally met in 2007 for a Tea in London Tour. It's always a special time when we have the chance to see each other again. Our two Canadian travelers, good friends from Ontario, were Judith (L) and Gloria (R). Judith is posting about this adventure on her blog Lavender Cottage where she shares her love of afternoon tea and gardening. Gloria shares that her father's family came from England and her mother's family from the east coast of Canada, where there was always a 'cup of tea' and conversation around the table. Teresa, our well coordinated Tea and Chocolate tasting hostess and Ohio representative, (note her felted tea pot bag), and Joanie from Michigan are shown here in the Grand Hotel on Mackinac Island. Joanie was the president of "The Women of Virtue Tea Society" where they would dress in Victorian apparel and visit various tea rooms. That sounds like fun! This trip was well documented! Lori (L), Phyllis (center), and Linda (R) are Michigan friends. Special thanks and great appreciation to Phyllis as she coordinated the trip, made all the required reservations, contacted attendees with all details, and kept us on schedule. Her detailed diary of this adventure can be found on her blog, The Relevant Tea Leaf. Lori (L), one of the Tea in London travelers brought her beautiful scrapbooks from that adventure so we could revisit that experience. Linda (above, right), also from Michigan has a long tea history hosting and organizing a tea club. She continues to entertain and share her love of tea. And she loves shopping, too! Barb (far left), a Detroit native, works with estate sales and grows Monarch butterflies! She says it's easy! My roommate for this getaway, Linda, is from Kentucky. Linda (R) and I first met as roommates on the Tea in London tour and then again for the Traveling Tea Friends trip to Kentucky. We have had the opportunity to vacation together with our families, and it was my pleasure to welcome Linda to Sweet Remembrances several years ago. 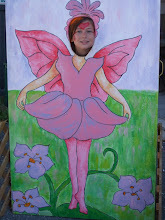 Linda blogs at Friendship Tea, and you can follow her experiences about this adventure. What a memorable teatime vacation! The Royal Park Hotel in Rochester, MI offers Afternoon Tea Wednesday through Sunday. Our group was greeted by this amazing tea table, where we enjoyed the Royalty Tea. There is an elegance about a hotel tea that makes an ordinary Wednesday a special occasion event. Beribboned teapots with the name of the tea attached marched down the center of the table. Mighty Leaf (loose leaf tea) is their brand of choice. The tea pot closest to me held English Breakfast. When the pots were empty, additional hot water was added and the tea leaves were steeped a second time. A glass of Sparkling Cider added a festive touch to the gathering. Tiered trays, laden with a bounty of tea treats, were festively arranged with a wispy piece of blue netting around the base. The Royalty Tea includes a variety of tea sandwiches. Roast Beef on Rosemary puff Pastry with Cheddar and horseradish Cream, Smoked Salmon BLT on rye, Hickory Smoked Chicken with Pear Chutney, Egg Salad Tomato Bruschetta, Cucumber with Herb Cream Cheese and Aged Cheddar Cheese Creme Brulee with Orange and Date. The middle tier held the English Fruit Scones which were served with clotted cream, lemon curd, honey and preserves. Hot Hors d'Oeuvres were offered separately which featured Spanakopita and Chef's Pear-Almond Brie EnCroute. Crispy, warm and tasty. And dessert yielded a bountiful plate full of assorted pastries that included Chocolate Covered Strawberries, Raspberry Tart, a large Shortbread Cookie, Cranberry Orange Bread, Orange Cheesecake Pop and Dark Chocolate Decadence. Although perhaps not the exact same recipe as was served at the Victorian Rose Tea House, I do have a recipe for Orange Marmalade Butter that is quite similar. Mix together, and enjoy. Particularly nice with cranberry scones, plain or blueberry scones. Ok, all scones!